There's little doubt that autumn has arrived at Hilton Pond Center. Tree leaves that survived the long summer drought are taking on orange and purple hues, and wood warbler migration is nearly complete. 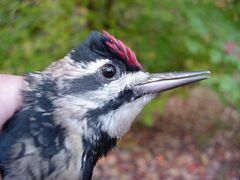 Plus, there's a "fall shuffle" going on in the Animal Kingdom--with many species wandering about as they leave their natal areas in pursuit of a mate or a quiet place to spend the winter. Over the next few weeks you may find that everything from mice to ladybugs has attempted to invade that big, warm, dry, safe place you call "home"--which is why we weren't surprised one chilly morning this week to see a snake a' crawlin' through our front door. We also weren't surprised when the creature reared back and struck as we tried to defend "our" territory. 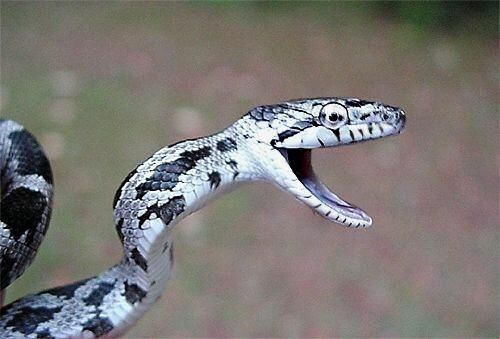 Some people we know would be alarmed to have a snake striking at their pantlegs, but we just smiled out loud as the serpent repeatedly reared and swung toward us with menacing jaws agape. Strike, recoil, strike--a classic aggressive behavior that apparently was intent on driving us away from the entrance to what this snake likely perceived as the warmest place available. After several minutes, we grew impatient with the snake's antics and--since we were already running late for an off-grounds appointment--we did the logical thing: We reached down, picked up the snake, put it in our coat pocket, zippered it shut, and drove on into town. We don't recommend that folks go around pocketing snakes unless they know what they're doing, but in this case we were certain the serpent was harmless. Besides, it wasn't actually big enough to hurt us--even though it bit our fingers several times. 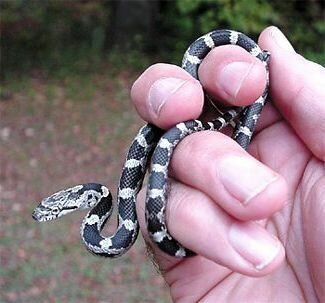 What we had in our pocket was ten inches of bluff--a Black Ratsnake hatchling whose teeth couldn't even break our skin. At first glance, our little reptile didn't look much like the common Black Ratsnake, Elaphe obsoleta, with which most folks are familiar. This species, which can grow to nearly eight feet long, occurs across the eastern U.S. 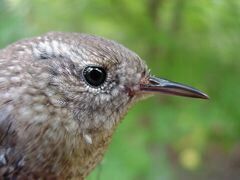 It is typically a deep, satiny black along its entire back (left), with a pure white chin--all very unlike the saddle-like pattern on the back of a hatchling. 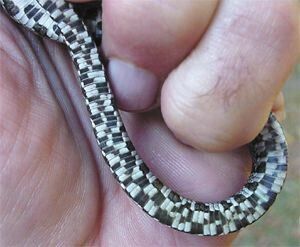 Even the undertail of a young Black Ratsnake is precisely marked with a tiny checkerboard of black and white (below right). On close examination, mature adults often show a hint of rectangular markings on the back, but each time a Black Ratsnake molts, its markings both above and below become more and more faint. Eventually, adults resemble the young only with regard to body shape. Most people recognize adult Black Ratsnakes and welcome them for their rodent-eating habits, but their young do not fare as well. Time and time again we hear from folks who used a garden shovel to whack off the head of a "Copperhead," only to learn on close examination that another baby Black Ratsnake had just bitten the dust. 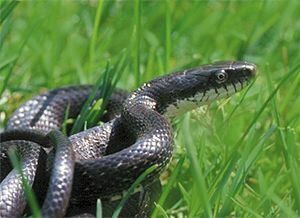 The confusion comes because people imagine that the rectangular markings of young Black Ratsnakes resemble the Copperhead's hourglass pattern, but even a cursory examination will show no similarity in pattern or body shape. 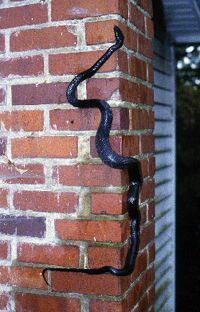 The heavy-bodied Copperhead is a venomous pit viper with a more or less triangular head, while Black Ratsnakes are nonpoisonous snakes whose sleek, muscular, nearly cylindrical bodies are adapted for constricting prey and climbing tree--or chimneys (see bottom photo). Perhaps the best--albeit riskiest--way to tell a Copperhead from any nonpoisonous snake here in the Piedmont is to look the serpent square in the eye. If the pupil is slit-shaped (left), it's a Copperhead. (Rattlesnakes and Cottonmouth Moccasins also have these "cat-eyes," which dilate in low light and become almost oval-shaped.) If the Piedmont snake has a round pupil instead (below right), you've got a nonpoisonous species--possibly a hatchling Black Ratsnake just looking for a place in which to spend the winter. When we returned from our hour-long trip to town, we unzipped the snakeling from our jacket pocket, double- checked the shape of its pupils, confirmed that it was indeed a Black Ratsnake, and took the photos seen here. Then we carefully placed our new-found friend in the crawl space under the old farmhouse at Hilton Pond Center--certain to be a warm, cozy place when December rolls around. For more information and photos about Copperheads, see "Copperhead!" You may wish to consult our Index of all nature topics covered since February 2000. This northern breeder spends winter across the southeastern U.S.